About SOTA: The story of SOTA Instruments SOTA Instruments Inc.
SOTA started as a dream. Our dream was to build a business that would be of service to others. We got our start as a result of a health challenge. As a result of feeling extremely tired all the time, Lesley quit her position as a Financial Controller for a clothing manufacturer and started the search for help. Over time she visited several natural health practitioners. Each one had something to offer but was not enough for her to overcome the fatigue. Lesley lived with the frustration of fatigue for 7 years. During those years Lesley had a strong sense that she would be able to use what she was learning to help others. That was what kept her going. After listening to an audiotape lecture about building electronic units that could restore energy, we were both intrigued. Russ was keen to help Lesley and it was a plus that he might be able to help with his love and passion for electronics. Within days of listening to the tape, we learned the fellow would be speaking in Seattle, Washington, just across the border from us. Eagerly, we purchased the instructions. When the speaker invited questions, Russ asked him about the possibility of improving on his designs. He admonished Russ for asking. He said many had tried without success so he suggested Russ follow his instructions. We returned home excited about the potential of this technology to help Lesley. Russ did change the design and made a unit that needed only one 9-volt battery instead of three. Lesley used what was to become the Silver Pulser. When she applied the microcurrents, she initially found she needed more sleep. After a 3-week session, she found she had more energy. It took three 3-week sessions, with a short break between each session, before her energy was restored. What a gift! We worked to assemble units for friends, family and others who wanted a unit. Our kitchen became the assembly station. The rest, as the saying goes, is history. 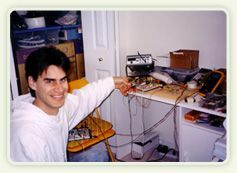 Russ was delighted that his life-long passion for electronics could produce a product that would help people with their health. As a next step, we wanted the inventor to inspect our unit and give it his approval. We wanted to make sure the unit worked as per his specifications. We wouldn’t feel right selling a unit unless we were sure it did. After getting our unit into the physicist’s hands, we received a call from him. Lesley answered the phone. She immediately recognized his voice. He had a very distinctive voice. It was an incredible blessing to speak with him because of how much she had been helped. He asked to speak with the man who had designed this incredible unit. In his resonant voice, he told Russ he was wearing the finest unit he’d seen. He told Russ it was an honor to know him. The honor was ours. This was the first of many calls that led to our friendship. After talking with the man, we knew what our mission was. The physicist was an eccentric genius and scientist. He was retired and lived on his own. In his heart he wanted to help people. His focus was on lecturing and getting the word out so people could build their own units. We knew that to serve more people, we needed a structure to collect information on how people were helped. We also knew there was a need for quality units at a reasonable price. Our role was to be stewards for this technology. As stewards, we guide SOTA to serve others. With the physicist’s endorsement, we prepared to make the units available on a larger scale. Lesley applied her new-found energy, and her business skills, to the task of organizing SOTA. Russ focused on design improvements, manufacturing and web design. As word-of-mouth spread, SOTA soon started to hear from people who had been helped using the units. It became a journey of amazement and surprise as we started to hear from people. It was a moving experience that touched our hearts … and continues to do so. A big boost came in January 2000 when Hilly Rose, hosting the hugely popular, late-night Art Bell radio program, invited SOTA to participate in a show. This program was broadcast throughout the US and Canada. We were invited to participate after several people called in about the units and mentioned SOTA. As a result, Hilly Rose interviewed the physicist, Russ and also Ed Griffin. Ed Griffin offered insights on the politics of health. Several caring people took the time to call in to share their experiences and enthusiasm about the units. At the SOTA office, all the telephone lines were busy from opening to closing. Listeners to this radio program expanded the word-of-mouth that allowed SOTA to continue to serve in ensuing years … years when the SOTA team could not directly say anything about the possible benefits of using the units while the company dealt with government regulators in the US and Canada. Government regulators had us in their sights for 4 years, from 2000 to 2004. The intimidation tactics used by government made these 4 years very difficult. Several times we came to a cross roads wondering whether or not to shut down. It was our dreams or waking dreams that kept us going. We look for guidance from Spirit or God in our dreams as well as from waking dreams. Waking dreams are events and words we observe around us in daily life—signals that Spirit uses to guide us when we ask for help to make decisions. One waking dream, in particular, gave us hope. We were flying to Los Angeles for a brief vacation in July 2000. It was early in the struggles with government and following a week in which SOTA had received a series of threatening letters from three government regulatory agencies. While flying at night, there was a brilliant flash of light in the sky. It was a beautiful sight and the pilot announced it was a test rocket launched by the government. The next day, we noticed a newspaper headline: Government Misses Its Target. The US Military had been testing an anti-missile to try to intercept the rocket. It was not successful in finding its target. We were encouraged as we felt that headline was a message for us from Spirit. The rocket represented SOTA and even though the government had us in their sights, they would miss. Government regulators would not shut us down. This dream was showing what to expect in the coming years. We were up against two teams—Health Canada and the US Federal Trade Commission (FTC). They would work together to try and beat us. We would out maneuver them ... and this is what would be important. The scoring was not important. We would not “out score” them. This dream proved to be accurate. Over the years of our government battles, we would use our creative faculties to survive … we called on our customers for feedback, we created relationships and understandings with government bureaucrats, and we got our elected representatives involved. Our website and internal policies would be in a constant state of change, in order to try and stay one step ahead. We worked tirelessly to be proactive and as creative as we could so that we could keep serving people, who believe as we do ... in the freedom of the individual to choose their health care. We didn’t always score wins, but we kept the ball on the court. When we received our freedom of information package from Health Canada, our maneuvering was recognized. They felt we were crafty and always changing—making it hard for them to keep on top of us. There was also mention of a telephone meeting between officials of the US and Canada, at which SOTA was discussed. Amazing that a little company like SOTA gained so much attention from government regulators. 1) It showed that SOTA would be injured. Our activities were curbed as we could not actively share information. We relied solely on existing customers to tell others about our units. 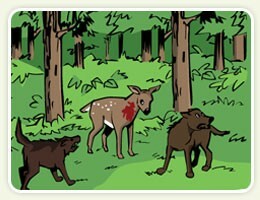 2) Like the deer, we would be submissive. We would pursue medical device licensing as requested by government regulators. 3) It told of a time when Health Canada would take their attention from SOTA and that we would need time to heal from the experience. The mainland represented where most people lived—the mainstream of society. The island represented the smaller group of people SOTA was presently serving. The dream indicated that SOTA needed to reach the mainstream. There was a safer way to do that. If we continued on our present course, it would be a dangerous crossing—a journey we might not survive. If we went in the opposite direction, there was a junction at which we could more safely attempt the journey to reach the mainland. This dream was a turning point for us. We had been resisting government demands. The dream told us we needed to change course—we needed to cooperate with government in order to continue to stay in business and serve those who want our products. The dream made us realize the route offered by government regulators to license our units as medical devices—the route we had been rejecting—would be the shortest and safest. After this dream, we changed our course. We created a new position within SOTA for a team member to correspond with government regulators and start the successful process of getting medical device licensing. The era of working to appease government regulators began. Several months later, one regulatory hurdle was resolved—in 2001 the FTC informed us they were withdrawing their charges. Russ had spent countless hours on the telephone with the FTC lawyer to create a relationship so the FTC would better understand SOTA. The turning point came when our customers responded to a questionnaire we mailed to them. We are eternally grateful to the customers who responded by letting us know they had not been deceived in making their purchase. Medical Devices or Consumer Products? Much of our energy was still being directed to the needs of Health Canada as we worked to satisfy government licensing requirements and the regulations for medical devices. To stay in business, government regulators forced us to pursue medical licensing. Our hearts had gradually closed as we focused on appeasing governments. Our hearts wanted our energy going towards helping people. At one point we had the Silver Pulser, the Magnetic Pulser and the Bio Tuner licensed. Once licensed, however, regulators constantly questioned the wisdom of having given licenses to some of our units. After three years, the government informed us we could be consumer products. This was what we had always wanted but we now needed time to consider our options. We had several meetings to discuss how to continue. Should we provide the information needed to keep medical licensing for all our units or should we surrender the licenses and have our units classed as consumer products? On January 22, 2004, we had a meeting with the SOTA team. As a result, we decided to continue to play a balancing act between being both medical devices and consumer products. This meant we must do all we could to maintain licensing … proceed with the extensive paperwork and expense to qualify for ISO 13485. ISO is the International Organization for Standardization, that sets standards for businesses. ISO 13485 is an ISO standard, published in 2003, that represents the requirements for a comprehensive management system for the design and manufacture of medical devices. On the way home after the meeting, Lesley felt uneasy. She felt we were biting off more than we could chew. We discussed our decision and Russ said we shouldn’t be going the medical device route—it is so costly and expensive. We went to bed exhausted with the question of what direction SOTA should take—a question that had haunted us for the past three years. First dream: “There was a long line, as long as the eye could see, of different animals facing a forest. Some of the animals were large and some were small. The small ones were similar to the size of an ostrich, maybe a bit bigger and the large ones were the size of an elephant. They were not animals of this world. Their plan was to go through the forest. I knew my spiritual guide had always warned me not to go into the forest. The forest was a very dangerous place. In this dream the forest represented government regulations. The large animals represented large corporations and the smaller animals represented smaller businesses like SOTA. Government regulations are designed for larger corporations so the large animals could successfully travel through the forest. The dream was telling us we will not survive the government regulatory route. Second dream: “I was sitting in a carriage from an earlier century. The one side of my face was covered with blood, as I had been injured. The driver of the carriage and one of my guards were taking care of me. There was a lot of love—I knew they had been with me for a long time. Sitting across from me in the carriage was a Lord or a man of great influence. He was a big man, vain and full of himself. As the viewer of the dream, I was also aware of what had happened. The Lord or man of influence represented the government. Those dear to me represented team members who wanted to continue with medical device licensing—they wanted to arrange a bad marriage. The guard who died symbolized the team member whose responsibility was corresponding with regulators in order to keep our medical licensing. Her job would be phased out. Third dream: "The scene changed and it was only the driver of the carriage with me. I still had blood all over one side of my face. We stopped for water at a huge pool. I was hungry and so took a few strands of shredded cabbage—I was careful not to take too much, because I knew food was scarce for so many people. I dropped the few strands in the dirt. I picked them up and headed to the pool of water. The driver who had finished at the water hole, warned me of a huge creature at the bottom that we must not stir. As I cleaned my cabbage I could faintly see something. The scene changed and in order to get back to the carriage, we had to swim across the pool. As we swam, the driver said the creature could see us. I looked at the bottom and carefully swam across the pool. I could see the huge creature at the bottom. It took up the whole pool and had eyes like a lobster. It was almost round in shape with cream-colored skin that was smooth like a whale. It watched us cross its pool. I felt no fear. Instead I felt love for this creature. Somehow I knew that as long as we crossed the pool gracefully and quietly without too much movement the creature would just observe us." The creature at the bottom represented the government. The driver was my spiritual guide. The message was to tread softly so as not to disturb the government. These three dreams gave us a clear message that the medical device licensing route was no longer needed. If we continued in that direction, we would not survive. We dropped the processes necessary to maintain licensing. We did, however, decide to proceed with CE certification for consumer products. This is a European standard that indicates an electronic unit conforms to essential safety requirements to operate as a household consumer product. After 4 years, Health Canada officially gave us the option to offer the units as Consumer Products with no licenses needed. Classification as Consumer Products still would not allow SOTA to share information freely but there was no need to feed the regulatory process. We felt a great sense of relief. Our hearts opened as we could once again put our attention on serving people. We are very grateful to our amazing customers. Through word-of-mouth, they kept us going. were balanced by his desire to help people. We greatly admire him for his desire to serve and better mankind. We love him for who he was. He passed on in June 2002.His wife arranged a memorial celebration in January 2003. 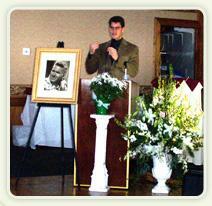 Russ had the privilege of being the Master of Ceremonies to celebrate his life. A friend associated with the health field urged us to attend the Electromed 2003 Conference in San Antonio, Texas. The US Military sponsored the conference, and friends felt it would be a good idea for those of us manufacturing outside of mainstream medicine to be there. A few days before the conference, we finally decided to attend. When Russ called to register us, after talking with the fellow organizing the program, he was informed one of the speakers had just cancelled. Russ was invited to speak. Russ boldly accepted. Then the doubts crept in. We didn’t have a prepared presentation. What would Russ say to this group of high-ranking officials and leading scientists? Thankfully, Russ is comfortable in front of an audience and often speaks with little preparation so we both felt he would do well. We prepared several points he could talk about. The conference was a daunting experience as all the speakers were engaged in formal laboratory research. They all had visual aids for their presentations. As Russ talked, we could feel the waves of shock rolling through the room. Here was a person who was not a scientist, doctor, nor PhD lecturing to a room full of scientists, doctors, and PhD’s. The audience was so silent you could have heard a pin drop. Russ felt like a small fish in a large container of water. Here was a small, upstart company, manufacturing units that were being sold and used by people around the globe … without extensive laboratory research or double-blind studies. Safety was established by comparison with other microcurrent units and several years of use. We had released an actual product to the public based on users continuing to report positive results. That step did not follow established scientific procedures. Russ made an effort to appeal to the group for opening further research into this field of electro-medicine based on the positive health responses from many people using the technology. The request seemed to fall on deaf ears. It was too difficult to set aside judgments and prejudices about what they were hearing from a layman. Immediately after Russ’ talk, we both wanted to crawl under the carpet and disappear. Instead, Russ made a point of returning to the conference despite his feelings of humiliation. He was glad he did. One of the Naval Officers attending the conference was a SOTA customer. Lieutenant Colonel Bob was thrilled to have representation from SOTA. Bob is a wonderful person, and meeting with him was definitely one of the highlights of our trip to Electromed 2003. In conversations, Bob helped to bridge what we were doing with the world of the researchers. Surprisingly, Russ ended up talking with several of those in attendance. They must have realized the guts it took for Russ to get up in front of this group and that his heart was genuine. To us, one of the most exciting lectures of the conference was a talk about Light Emitting Diodes (LEDs) used by NASA. As soon as we returned home, Russ completed the design for the LightWorks. An aspect of the SOTA mission is to serve by offering products for health, well-being and relaxation; are of the highest quality, and we can offer at an affordable price. We continued with our mission by adding the LightWorks in 2007. In order to provide more information about the use of the SOTA units, we decided to develop a SOTA Community. We would allow those who completed a list of questions to show they took complete responsibility for their health and the information they would access in the SOTA Community website. We would make the experiences customers shared using the units available on this site. Having worked to prepare the new Community for about 5 years, Lesley had a dream warning us that providing more information through membership in a Community would not protect SOTA from government regulations. While pondering what to do after so much work to prepare the SOTA Community, Lesley had another dream: “We had airline tickets to fly out at 8 a.m. in the morning. Four of us on the SOTA team were meeting and discussing things. I looked at my watch and it was past 8 a.m. We had talked and gotten absorbed in our meeting and missed our plane. This flight was a short flight on a smaller plane that connected to a much longer flight with a larger plane that we were going to be taking. Lesley realized the dream was saying that we are not late and have not missed the plane nor our connection. What we are working on right now at SOTA is equivalent to the smaller plane. We are working towards making the protocol available to a much larger audience = longer connecting flight and larger plane. We are on schedule even though we think we are late. First Dream: “One of the SOTA team and I were driving along a highway. There were many curves in the highway, and while our team member thought she took a curve in the highway, she actually went off the highway and drove uphill on the rocks. She was driving fast and had difficulty keeping control of the van as it climbed higher and higher over the rocks. We were headed straight for a steep cliff. She slammed on the brakes and the van turned upside down as we slid ever closer to the cliff. I asked Spirit for protection. The van stopped at the cliff edge. We got out. I picked up the van and put it right way up and turned it facing so that it could drive along the cliff edge. I noticed my companion was standing with her mouth open as I did this ... the thought went through my mind that this would be considered quite a feat but I had found it easy. The dream is showing how fast we are going … so fast that we are unable to stay on the quiet, winding, highway. Our current course will take us off the quiet highway onto a very bumpy path and we are headed right for a cliff. The strength to turn the van (SOTA) around is there and it will be quite easy. Once we do turn the van around, we will be hindered in how we can communicate with others—the people mumbling and us not being able to communicate clearly. Second dream: “We were in a classroom setting and seemed to be learning about beauty and self-care. The classes were finished and we were to go to a place for a final lesson or test or something. I was driving Russ’ vehicle and four others were coming with me. Others were going in another vehicle. We had to be cleared by officials similar to a government checkpoint like custom’s officials at a country’s border or airport in order to get to our destination. “There was a long line-up at this inspection station. Every time we tried to go through the metal detector, people would get bunched up and the machine would shut down. The female officer in charge would make us all backup and try again. The same thing would happen again and again. After about the third or fourth time, one or two people got fed up and made a run for their destination. That made the official very angry. She stopped the whole line and sounded the alarm. She was very angry that these people didn’t respect her authority. 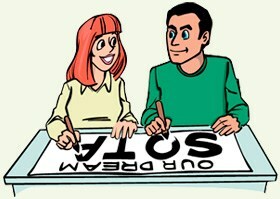 The beauty class is a symbol for the new SOTA look—new units and new website. We are on the final stretch for the beauty classes which is the new SOTA Community website. If we don’t heed the advice in the dream, the government will make us slow down and back up repeatedly … as did the government official. This dream is also showing that if we continue on our current path to get to the final class or to launch the planned SOTA Community website ... we will be like the two people that tried to run through the line and ended up sounding the alarms. We will have government upset with us. In addition, the morning after the two dreams just reported, Lesley received an answer through her waking dream. While sitting at her desk, a blue jay came to the window. It caught Lesley’s attention and looked right at her. The dreams and waking dream were confirmation enough to show us we must change direction for the planned SOTA Community. As a result, the SOTA Community was scaled down. It provides limited additional information and allows for the purchase of the SOTA units online. We will continue to make the SOTA units available as consumer products. The willingness of so many to share their experiences with the units and let others know about us allows us to continue to help others. For our part, we are grateful for the opportunity to be caretakers of SOTA.